The legacy and reputation of many significant Victorians is complex and contradictory because their often great achievements were fashioned on the oppression of Empire and the superiority and arrogance which fuelled aggressive expansion presenting exploitation of others and their natural resources as being the introduction of civilisation. Our inability to separate individual Victorians and their achievements from the often unacknowledged contradictions of the era which gave them birth, informs every page of Barlow’s informed and informative biography. As a Trustee of The Kempe Society, Barlow is as knowledgeable a biographer as could be expected but his understanding of the era and its subsequent reputation also mean that he is able to be an effective assessor of Kempe’s achievement. I first encountered Kempe at St John’s Seven Kings, my first incumbency, where we had a window made by C.E. Kempe & Co. People in the parish knew that Kempe windows were of significance and knew that theirs was a later design because the Kempe family emblem, the wheatsheaf, had a tower superimposed; the mark that the firm used after Kempe’s death. Despite their knowledge of these elements of the Kempe story, in a major reordering of the entire building, the Lady Chapel, for which the Kempe window had been the focal point, had become a meeting room with storage cupboards below the window where an altar once had stood. The changed use of the space affected one’s ability to view the window as originally intended. Despite this the quality and interest of this window was still apparent contrasting positively, as it did, with less inspired glass from the Whitefriars Studio in the other windows of the same room. This change, however, seems symptomatic of Kempe’s reputation in the post-Victorian period; of sufficient significance to be retained in the reordering, but not of such significance that it cannot be somewhat obscured within that same reordering. Kempe’s inspiration was formed, as with that of the Pre-Raphaelites and the Arts and Crafts movement initiated by Willam Morris, by the Gothic Revival. Barlow clearly identifies the differences in inspiration that existed between these different movements, with Kempe’s inspiration being primarily found in Northern European churches and cathedrals of the 15th and early 16th centuries. Barlow is of equal help when assessing the respective contributions and differing emphases of the essentially anonymous artists who worked in Kempe’s studio. Barlow carefully teases out the distinctions of the differing contributions made by Kempe himself and his artists – Wyndham Hope Hughes, John Carter and John William Lisle – as well as the differences in individual styles within the overarching Kempe style. Kempe’s is a fascinating story of a self-made man in tune with his own era who built a brand able to endure for sixty years. In common with A.W.N. Pugin, William Morris and G.F. Watts, he also created a home which fully expressed his personal inspiration and vision and was considered a masterpiece in its day. In one volume Barlow tells Kempe’s story and that of his collaborators, assesses key works and considers Kempe’s legacy and reputation. He brings Kempe’s faith-full practice to life while arguing for the ongoing significance of work based on an unchanging belief that past styles of faith were the best expression for contemporary faith. Through Barlow’s explanatory prose and psychological profiling we appreciate and understand Kempe’s motivations and the reception given to the work of his studio. As Barlow unpacks and critiques later criticisms of the works from Kempe’s studio, it is probable that many will nevertheless retain the sense that there was little evolution in the style of glass produced by the studio and that their preferred style reflected Victorian conceptions of beauty. All of which seems to suggest that Kempe is, while being a deeply interesting character, a typically Victorian figure; someone bound by his era, rather than transcending it. Yet there are also many surprises within the tale told, including, in 1887, his plan to remove the pews from his local church and replace these with modern pews or individual chairs. This book adds greatly to our knowledge and understanding of Kempe’s studio and achievements. 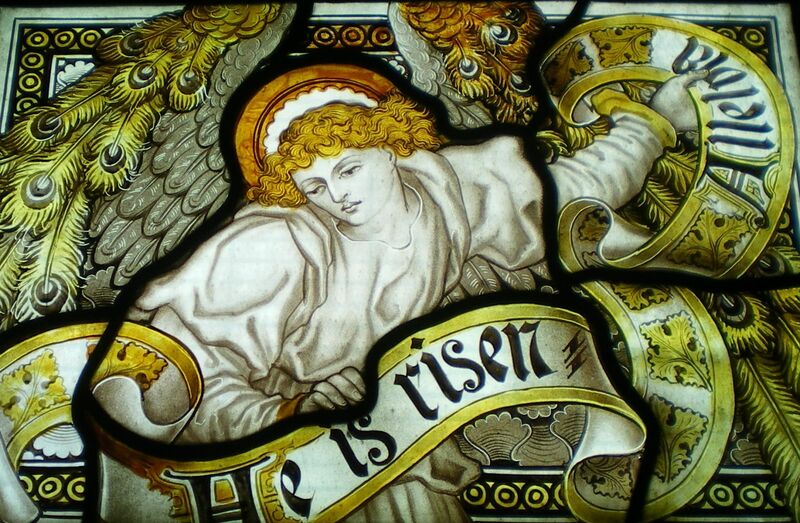 These are revealed as being much broader than simply his reputation for stained glass and also as synergous to and analogous to the work of Morris & Co. The significance and spirituality of the work is made clear in ways which counteract the stereotype that developed of mass production of a static style. Barlow also develops our understanding of this era, its tastes and innovations, through the portrait he draws of a man who exemplified both. This book is invaluable for the way in which it adds significantly to our understanding of the man, the studio, the works and the era. It should be of particular interest to the many churches which, like St John’s Seven Kings, are fortunate to possess a Kempe.